A novice surfer in Australia fended off a shark by punching it in the face as it attacked him, but not before it bit him in the shoulder. British doctor Charlie Fry was surfing off the north coast of Sydney with a friend on Monday when he felt something bang into his shoulder. Turning around, he saw a shark that was about 1.8 metres (6 feet) coming at him with its teeth bared. The 25-year-old, who has only been surfing for two months, said he didn’t even notice he had been bitten, as he was overwhelmed with adrenaline and the primal urge for survival. In the heat of the moment, he remembered how surfing champion Mick Fanning had famously handled a shark attack in 2015. The moment was captured in a video during a surfing contest. “Me and my friends have just started surfing, and we saw the YouTube clip of Mick Fanning saying he punched [a shark] in the nose,” he told The Sydney Morning Herald. Fry, who was surfing off Avoca Beach in New South Wales on Nov. 13, said he didn’t feel the shark’s teeth going into his shoulder. “It felt like I was smacked, it felt like a hand, a hand grabbing me, shaking me,” he told Australia’s Nine News. Fry then managed to scramble back onto his board, shout to his friends, and catch a wave to the shore—and to safety. “It was just pure adrenaline, I genuinely thought I was going to die, like ‘you’re about to be eaten alive by a shark’, so everything slowed down, like ‘get on your board and surf,’” he said. Fry is a British citizen, and has only been surfing for the two months he has been living in Australia where he works in a hospital. Fortunately for Fry, his friends are medically trained and were able to offer first aid before he was taken to Gosford Hospital, where he was treated for puncture wounds to his right shoulder. According to experts, punching a shark in the face is a good strategy in the event of an attack. Ryan Johnson, a shark researcher and documentary maker who studies great whites, advises using “something hard—be it a camera, a stick, a rock” to push the shark away. “In a situation where you don’t have that, going for the face and the gills and trying to keep your hands out of its mouth is always the best thing,” he told the BBC. A New South Wales rescue helicopter later that day reported sighting a 3 m (9.8 ft) white shark in the area, tweeting a picture taken from a helicopter. They said that they would send up a drone the following day to scan the area. 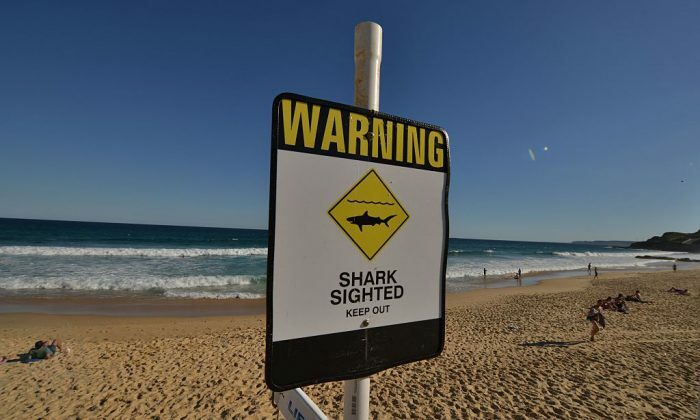 Drones are increasingly used to protect beach-goers from shark attacks in Australia. Video footage from drones has revealed sharks coming perilously close to surfers, who remain oblivious to the threat just beneath the surface.